Huh. Just for puking? That’s strange. Are you sure? My first thought was it is for washing the feet. If this is indeed for puking, maybe you shouldn’t eat there. So clean and sterile looking. Restaurants here could really take a lesson in cleanliness from the folks there. Now that’s a first!I think it’s a bad idea, though. I do appreciate cleanliness in the bathroom but really!!! Now I want a puke bowl! I could start a company, Pukebowls R Us! Probably a few people got really sick from the seafood? Or the food is too good and ate too much, need to throw up afterwards? I’d be very curious if they have the same thing installed in the ladies room? Shouldn’t there be some handles nearby so you don’t fall face first into the puker? And some tissue, mouthwash and mints nearby would be nice too. thank god, I always wondered why I never had a special place to puke after my meals. VIVA LA BANGKOK! I think you should tell them that they are missing knee pads. i was gonna say it was a urinal but WOW a special sink for throwing up?! it’s like the vomitorium of the romans! Another first for me. You are very talented in finding the offbeat. I thought it was some sort of a bidet! But I would need some handles and a stool of some sort to rest my knees on if I have to throw up. But how disgusting to have it in a good restaurant. So they expect their clients to may be go puke after eating? Bleh! @ElusiveWords – @ZSA_MD – @Wangium – Handles, kneepads – there definitely are ways the design could be improved. It is at a height, though, that seems reasonably convenient if you are in a rush. @jillcarmel – @beowulf222 – @CurryPuffy – @ohellino – It is indeed strange. The restaurant is very clean and has a sterling reputation, so I can’t imagine that their food induces sickness. Maybe it is installed more as a joke? Perhaps the owner also owns a toilet bowl company and wanted to show off their design prowess? @Inciteful – I swear, I don’t try to find offbeat things. I just happen upon them! @lil_squirrel4ever – @Randy7777 – Yeah, gross and weird and wouldn’t you know, this entry has received more views and comments more quickly than any other in several months. Lowest common denominator, huh? @agmhkg – Perhaps it has already proven practical! @LadyboyRevolution – Have lived here almost seven years. @iskrak – Indeed, just like the Romans! @nicolemcw – It sets the city apart, for sure. @LastStopCrazyTown – @Fatcat723 – @Grannys_Place – You really do have to admire the cleanliness. I mean, if I were feeling ill, that would be a nice facility to use. Not much privacy, but other than that…@Kellsbella – It would seem that someone has already stolen your business idea! @stepaside_loser – Why do you think that? it reminded me of a bidet. when i was traveling in europe and especially in france they were everywhere in every hotel room. i never liked them. on the other hand better a puke bowl then in the sink or the urinal. was there a stool for bms in there also? @christao408 – Doesn’t whet the appetite to hear of a restaurant that has a dedicated sink for throwing up – especially when seafood is involved. It’s really odd! @stepaside_loser – Good point. @marc11864 – Please don’t. 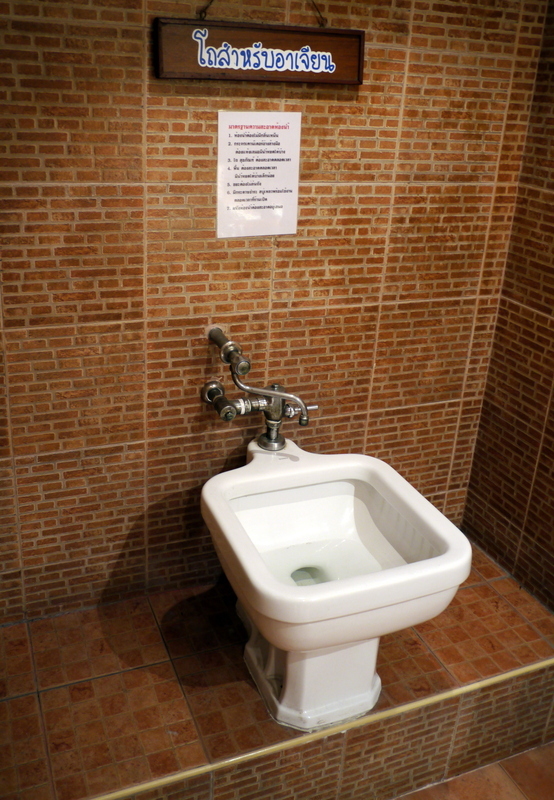 @grannykaren – A huge bidet! The picture makes it look extremely clean – like it was just built. You were there and saw it up close… was it like how it looks in the picture? guess the restaurant has been known to get many customers who get sick over the food they ate there. i’d stay away from that establishment if i were you. @rudyhou – Well, the food was tasty and the price was reasonable. Didn’t have any problems.